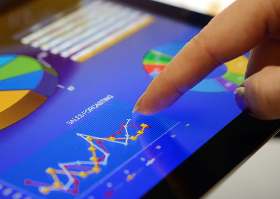 RBS shares have outperformed in 2019, but are playing catch up. The charts say this will happen next. The comedy bank Royal Bank of Scotland (LSE:RBS) continues to flounder around doing very little. At time of writing, the price is 239.1p which is, 23.91p in old money. Not the most scintillating increase since the gory days of 9p (in old money) a few years ago. We suspect we're not the only folk still dividing the price by 10 to return to the "real" share price. At present, we'd be justified in raising an eyebrow if it were to relax (again) below 230p as a return to 221p makes sense. Our secondary, with a break below 221p, calculates at 204p and hopefully a bottom. As the chart highlights, there's a 'red' uptrend since the Brexit vote which would hopefully justify a bounce, should 204p make a guest appearance. The real trouble would visit should the share price actually close a session below 204p, as some big picture reversals become extremely possible. Initially, there's a fair chance of a visit to 177p followed by some sort of fake rebound. But our secondary, if such a level breaks, calculates at 145p (or 14.5p in old money) and ideally, a real bounce. The implications below such a level are too foul to list. In our heads, we've been using the retail banks as our true market barometer, essentially failing to trust any movement the FTSE 100 index makes unless we see it echoed in the financial sector. Unlike politicians' brain cavity, there is not a lot of echoing going on at present. 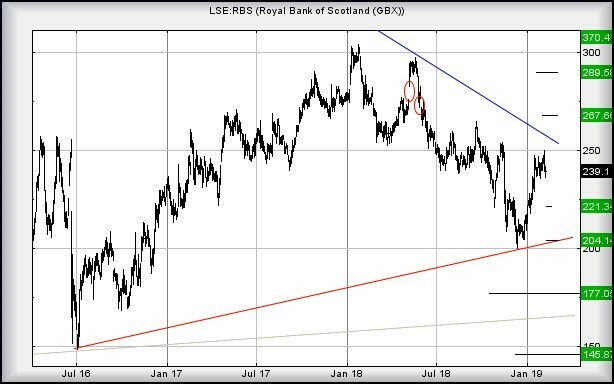 We suspect the important downtrend on RBS is shown in 'blue' on the chart. This being the case, the share price currently must exceed 256p to be viewed as entering a phase toward an initial 267p. Our longer-term secondary, if exceeded, computes at 289p. For now, we rather suspect 204p shall make itself known.